I was first introduced to the concept of “tapping” to balance energy in the meridians by late Grand Master of Thai Medicine, Aachan, Moh Boontum Kitniwan in 1988. 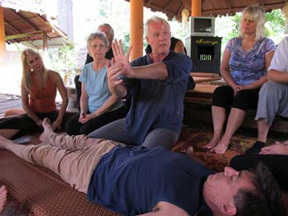 The technique in Thai is referred to as “Tok Sen” (Hit the Line). In 1991, I was introduced to a Japanese variation by master of Shiatsu, Toshiko Phipps. 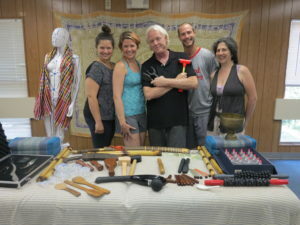 The initial techniques Toshi introduced to me were performed with a little wooden hammer and a wooden probe (Manaka Hammer). We would do a pulse and or Hara assessment to determine which meridians and corresponding points would need balancing and then apply the probe and tapp it with the hammer. Toshi also related to me that it was her understanding that originally the technique was part of Tibetan and Chinese acupuncture. My feeling and understanding of what these various masters told me is that the use is quite ancient and was practiced in some form or another throughout Asia and Southeast Asia.